Students board buses to participate in Acts 1:8, the annual Momentum Youth Conference outreach. More than 1,200 students and adults descended upon the Johnstown, Pa., area this afternoon (Saturday, July 16) during the annual Momentum Youth Conference outreach. This year it was called Acts 1:8 and included acts of caring, moments of sharing, and opportunities to pack supplies that will impact young people in Johnstown and around the world. Bus- and van-loads of teens filed out of the campus of the University of Pittsburg, Johnston, shortly after 9 a.m. this morning. Some went as far away as Pittsburgh, where they worked with Habitat for Humanity. Others ventured to sites around the Johnstown area, which is nestled in the Allegheny Mountains about 70 miles east of Pittsburgh, to host park outreach events to share about Jesus Christ, pull weeds, or do simple acts of kindess. Some stayed on campus to pack WASH (water, sanitation, and hygiene) kits that will be used in Haiti. 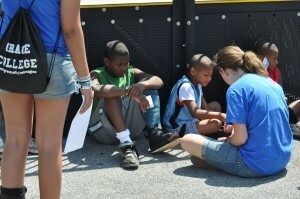 Students share the Gospel with children at a Johnstown skate park. Up the road at Davidsville Community Church, a Grace Brethren congregation pastored by Michael Beam, the Operation Barnabas team was setting up for an indoor program. Marissa and Morgan, from Buena Vista, Va., were among a group of students who were canvassing a nearby trailer park, inviting people to come to the event. “I want to meet one-on-one with the kids and hope to lead one to Christ,” said Morgan. Amy, from Waldorf, Md., echoed, “I love the idea of bringing children to Christ.” She said that the outreach was the favorite part of the Momentum week. “We get to bring what we’ve learned and put it to use,” she said. In another neighborhood, Jessie, of Atlanta, Ga., was also handing out flyers. “We’re inviting kids to come to the Fun in the Sun program,” she said as she held out a bright yellow piece of paper. Back in Johnstown, Stephanie, from Waynesboro, Pa., was pulling weeds at a skate park. “I want to help the community and make things a little bit nice,” she said, taking a break for lunch. 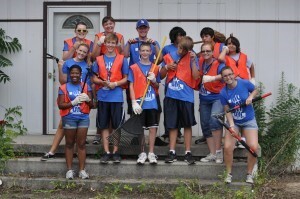 Students pulled weeds in a lot that had been abandoned for more than five years. A mile or so down the street, another group pulled weeds at a lot that had been abandoned for five years. “I like coming out and helping with whatever I can,” said Mallory, 18, from Norwalk, Calif.
“We’re picking weeds because we want to serve Jesus,” added Ashley, 18, from Macedonia, Ohio. “I feel like everyone should be able to have as nice a city as I live in,” noted Vaniesh, a sophomore from Macedonia, Ohio. As their ministries concluded, the teams straggled back to campus throughout the afternoon. Following a picnic dinner, they will have an opportunity to share their stories at tonight’s final Momentum session. Jeff Bogue, senior pastor of Grace Church, a Grace Brethren church in Akron, Ohio, will challenge the teens to live what they learned this week in their own communities. Aaron Keyes will lead worship one last time and the evening will conclude with communion and a wedding feast celebration.